spritehand: Physamajig on Windows Phone and Azure! Physamajig on Windows Phone and Azure! 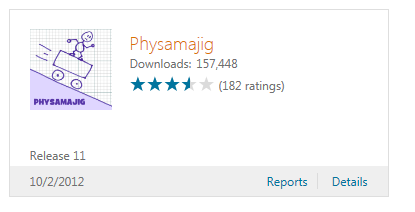 My app "Physamajig" was one of the first apps available on the Windows 8 Store, and now has over 150,000 downloads. Physamajig is written using XAML/C# and uses the Physics Helper XAML and Farseer Physics Engine projects. I was recently lucky enough to win an AppCampus award to port Physamajig to Windows Phone 7! The AppCampus program was formed by Microsoft and Nokia to "drive innovation and business opportunities" and "create a new generation of self-sustaining mobile startups." If you have a great mobile app idea, you can still apply for an AppCampus award by filling out a s hort application. Physamajig has a back-end web service which allows users to share their physics games. As part of the groundwork for the port to Windows Phone, I wanted to make sure my back-end data service could handle any increase in traffic from users. Originally, I was using a shared hosting plan from a popular provider - but where I wanted to go was Windows Azure! First, I used SQL Server Management Studio to connect to my two databases: my legacy shared db, and the Azure SQL db. The I used the Generate Scripts Wizard to migrate the data from the legacy db to Azure SQL. These steps are outlined for you here. Note that you can use the "Fully Qualified DNS Name" of your Azure SQL database from the management portal under Database. I then used the VS Templates for Azure to create a Windows Azure Cloud Service and WCF Service Web Role. Since I had a pre-existing service, I just brought the code over into the WCF Web Role. Physamajig has thumbnail images that allow users to quickly shuffle through the available online creations. These thumbnails are generated by a moderator when they approve creations for online use. For these thumbnails, I used Azure Storage in a public folder. This involved using the CloudStorageAccount class to add a CloudBlobContainer consisting of CloudBlob (files) for each thumbnail. I hope you enjoyed this little peek into what's happening with Physamajig, and please look for the app in the Windows Phone marketplace soon!